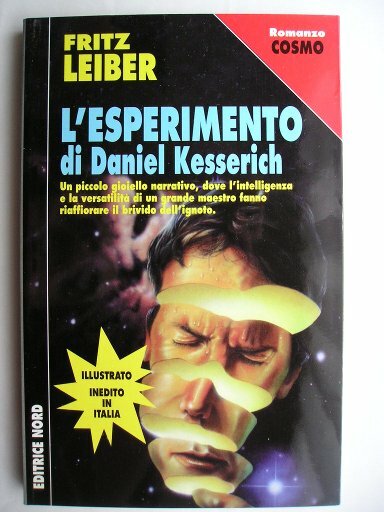 The illustrated novella “The Dealings of Daniel Kesserich” by Fritz Leiber was published for the first time in 1995 in the magazine “Omni Online” and as a book in 1997. George Kramer had two great friends at the university: Daniel Kesserich and John Ellis. Mary Andrews, another student of the same university, married John. After graduation, their paths were divided but ten years later George receives the news of Mary’s death and reaches his old friends in Smithsville, a small California town. In Smithsville, George discovers that Mary died in unclear circumstances and strange things happen since he arrived in town, including the explosion of Daniel’s laboratory. John seems to have disappeared and hysteria seems to spread among local people. The story of “The Dealings of Daniel Kesserich” is really curious. Fritz Leiber wrote this novella in the ’30s, when he was at the beginning of his writing career. The original version was rejected by the magazine “Weird Tales”, a few years after Leiber wanted to review it to submit it to the magazine “Unknown Worlds” but it ceased publication. The years passed and the science fiction and horror genres evolved so Leiber couldn’t sell this novella, which at one point got lost. It was only shortly before Fritz Leiber’s death that “The Dealings of Daniel Kesserich” was found in his agent’s archive. Unfortunately, the author’s death caused a further delay and eventually this novella was published only after about sixty years from the writing of the original version. In the ’30s, Fritz Leiber had a correspondence with H.P. Lovecraft, who was already famous and appreciated the first stories of his young fellow writer. To write “The Dealings of Daniel Kesserich”, Leiber was inspired by Lovecraft in the themes, especially the one of the forbidden knowledge with its consequences, and in the atmosphere of this novella. However, “The Dealings of Daniel Kesserich” is a science fiction story, although initially that’s not clear. On the other hand, for both Fritz Leiber and H.P. Lovecraft labels are limiting because they both wrote stories that span across different genres. “The Dealings of Daniel Kesserich” is the report written by the protagonist George Kramer on a strange story involving him and especially his three old friends in a small California town. The subtitle is “A study of the mass-insanity at Smithsville” because the story involves substantially all of its inhabitants. The atmosphere, especially at the beginning of “The Dealings of Daniel Kesserich”, is more of a horror story, with the strange events experienced by George Kramer on his arrival in Smithsville and especially with the mystery surrounding the death of Mary Andrews. The circumstances of her death seem to become stranger and stranger and signs of tempering on her grave trigger a series of terrible events that include panic among the town’s inhabitants. You can seen that “The Dealings of Daniel Kesserich” is a bit rough, with an initial part that’s rather verbose for a novella. The style, in the form of report, was perhaps already a bit old fashioned when it was written. However, soon it gets to the heart of the story and you can see that early in his career Fritz Leiber could already create a sophisticated and consistent plot. Today it may seem strange that a work by a writer who became as famous as Fritz Leiber could even disappear for decades. The market for science fiction and horror stories was very different and together with the strange story of “The Dealings of Daniel Kesserich” it had the effect of having it published only posthumously. If the manuscript hadn’t been lost for decades and Leiber had the opportunity to review it thoroughly maybe he would’ve written a novel of some length. If Stephen King rewrote it, the result would be ten times longer! Overall, I think that “The Dealings of Daniel Kesserich” is a good novella. Because of its limited length and the fact that it’s not a true classic I recommend it to the fans of Fritz Leiber and of stories of the time when it was written.